Stainless Steel is difficult to drill because of its hardness, toughness, and work-hardening properties. As a cutting edge shears away a chip, it causes the material at the cutting interface to work-harden, creating a work-affected zone that makes penetration by subsequent cutting edges more difficult. Rapid heat build-up and further hardening will follow if the cutter cannot penetrate this work-hardened surface. This is characteristic of ordinary hole saws and is why they fail after just a few cuts. The Evergreen Holecutting System solves these and other problems. It was specifically designed for stainless steel but works equally well when called upon to cut other materials up to 5mm (3/16″) thick including carbon steels, copper, aluminium, and brass as well as many plastics. 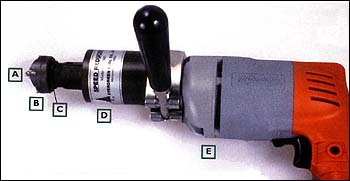 In any hand-held tool, the applied cutting force is limited by the user?s strength. The Evergreen System cutters concentrate that force on three cutting teeth. This produces a higher cutting pressure per tooth than the many teeth in a conventional hole saw. Also, the cutting teeth have an aggressive rake angle, high back clearance and minimum curf (width) to be able to cut underneath the work-hardened surface to softer material. The depth of the cut is limited by the raker teeth to provide smooth cutting and prevent stalling. The cutter body is also tapered inside and out to minimize friction and heat build-up. Sizes ? – 2 ?” in 1/8 steps. 3/16″ or 5mm depth of cut. The output adapter and cutters feature a special 4-start thread. These threads provide greater torque transmission through the thread and make the cutter removal much easier and faster, especially with the aid of the loosening washer. One tug on the loosening washer with a 1 inch wrench breaks the cutter loose for quick removal. Stainless steel required a low cutting speed of about 60 surface feet per minute (SFPA), roughly half that of low carbon steel, to minimize friction and heat build-up. The System coaxial speed reducer is a planetary gear set that provides a 4:1 gear reduction for the cutter and no reduction for the pilot drill. Although an ordinary variable speed drill can rotate slowly, these is not sufficient torque at low speeds to drive a holecutter. A 0-1,000 RPM drill motor with the System 1 speed reducer will produce an optimal speed of 0-250 RPM for the holecutting with four times the torque. This torque is sufficient to drive even the larger cutters. This reduction in speed results in smooth, controllable power greatly improving the cutting performance and tool life. The drill motor supplied with the Evergreen Holecutting System 1 is a 3/8″ variable speed, reversing, 0-1000 RPM, Milwaukee holeshooter, catalogue no. 0228-1. This drill motor has a 3/8″-24 UNF thread on the chuck spindle and a 1.540″ diameter boss just behind the drill chuck. These specifications are important to readily attach the System 1 speed reducer to the drill motor and to ensure the proper operating speed of the cutter. Other electric drills with 43 mm neck or air drills with special adaption collar can be used and 1/2″ UNF thread adaptor (max. RPM of drill 1000). Optimal cutting speed, tooth geometry and pilot drill design. Remarkable improvement in tool life and cutting efficiency. The best tool available for effective and economical hole cutting. Stainless Steel Fabrications – food & winery machinery. Electrical contractors – switchboard manufacturers. Specifically designed for stainless steel but works equally well when called upon to cut other materials up to 5mm (3/16″) thick including carbon steels, copper, aluminium, and brass as well as many plastics.